Hudson Valley, a preferred getaway for city dwellers, is home to a plethora of beautifully designed houses, from large estates to cozy log cabins. 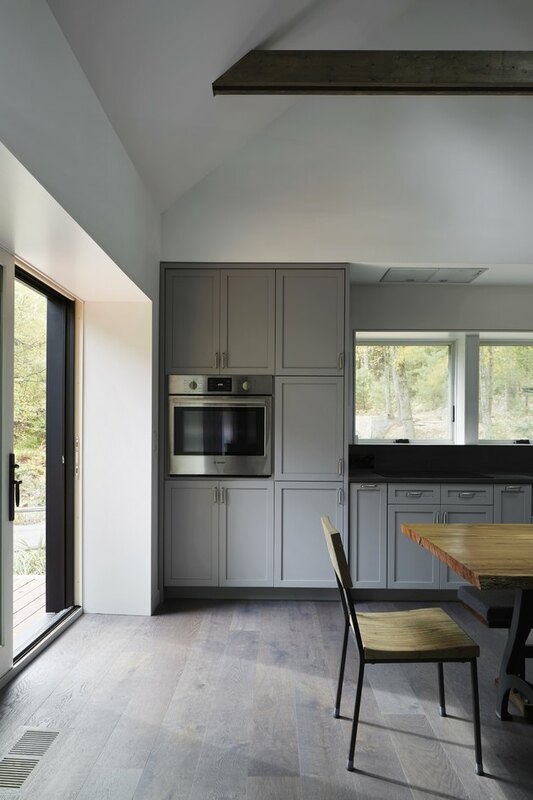 When a nature-loving couple came to architectural firm Takatina to re-do their woodsy stone house, Takatina wanted to make sure the structure retained its Hudson-ness, if you will, and so the Putnam Valley-based firm gathered inspiration from the region's common barn structures. Tasked with keeping the stone wall intact, the team created an exterior that incorporates an array of new and old materials. 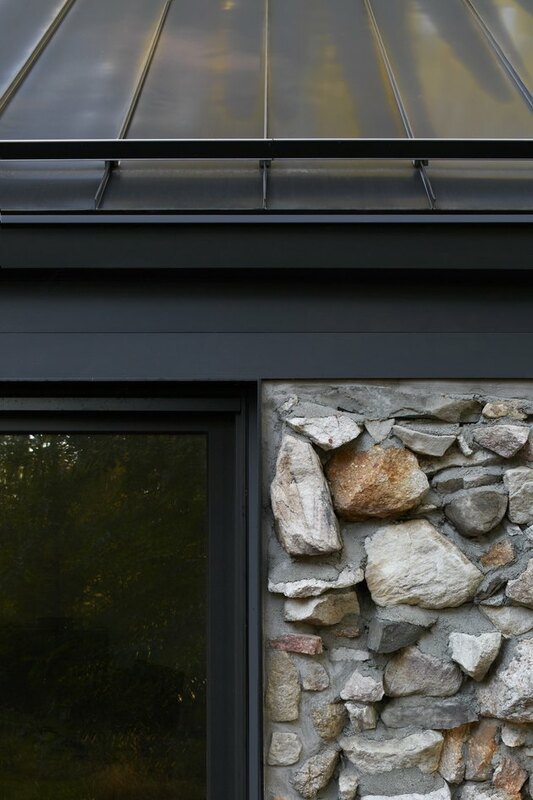 The new exterior combines a custom-color stained cedar siding with a metal roof and anodized metal plates on the facade to separate the new and existing stone wall. "We came up with the concept of 'new' to wrap around the existing [structure], as if hands were holding something precious. With that concept, we developed the shape and the transition details of how new meets old," Christina Kawabata, partner at Takatina, said. 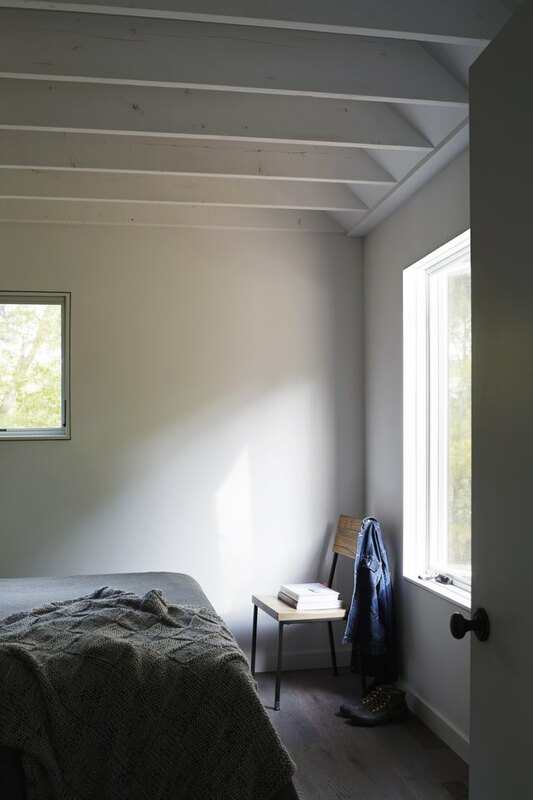 The end result is a smaller, 1,000-square-foot, single-story structure with a 300-square-foot basement that more efficiently uses the interior space. The exterior cladding is made of cedar, which was stained with a custom color. The deck was built with Brazilian teak from Advantage Lumber. 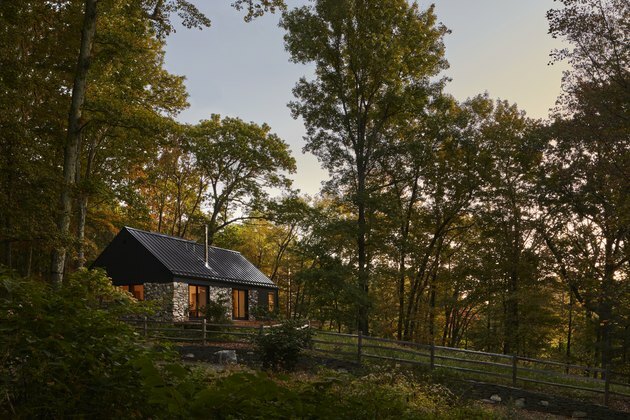 The home is crowned with a matte black standing seam metal roof. Windows and doors are Integrity from Marvin. On the exterior, an anodized metal plate separates the new and existing stone wall. 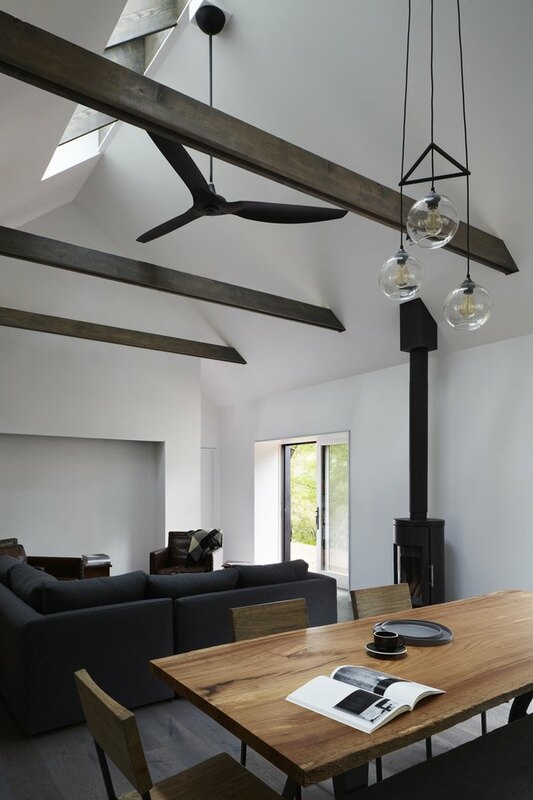 A skylight brings in more natural light to the home. 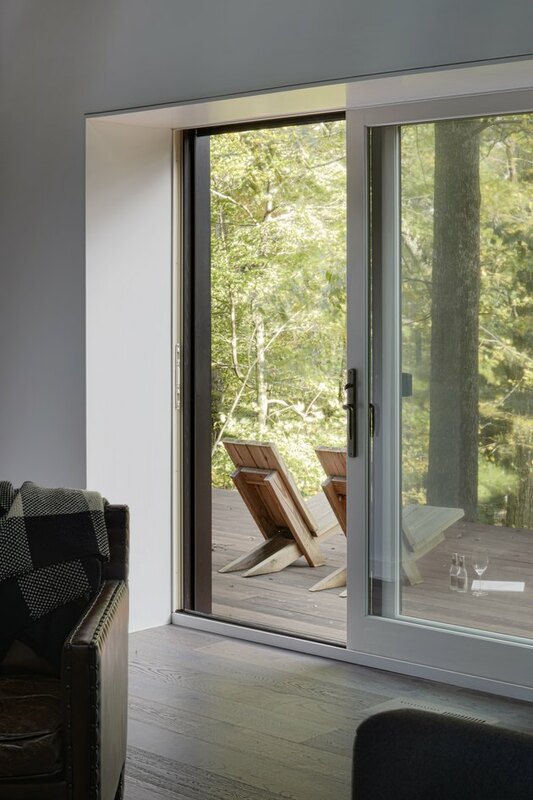 A spacious wood deck allows for peaceful reflection of the surrounding woods. The dining and kitchen areas feature a mix of local furnishings, modern pieces, and custom-made fixtures. A dining tabletop from Berkshire wood products, located in Sheffield, MA, adds to the East Coast charm of the cabin. Dining chairs are from AllModern. The living room features a collection of locally sourced furnishings. Leather club chairs and a wool rug from Dartbrook Rustic Goods, located in Keene, NY, provide the perfect calm and pastoral setting. 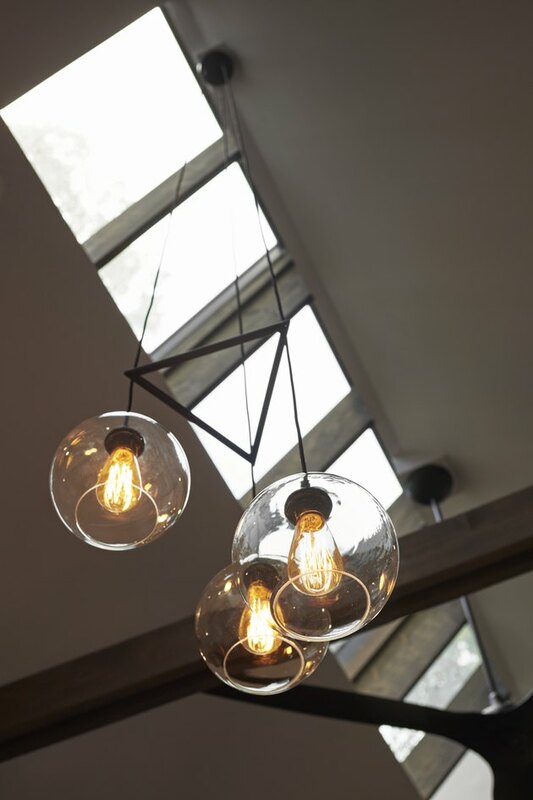 The lighting throughout the home was curated by a designer to balance natural and artificial light in perfect harmony. The walls are painted with Benjamin Moore's Decorator's White, which gives dark furniture an ideal contrasting backdrop. 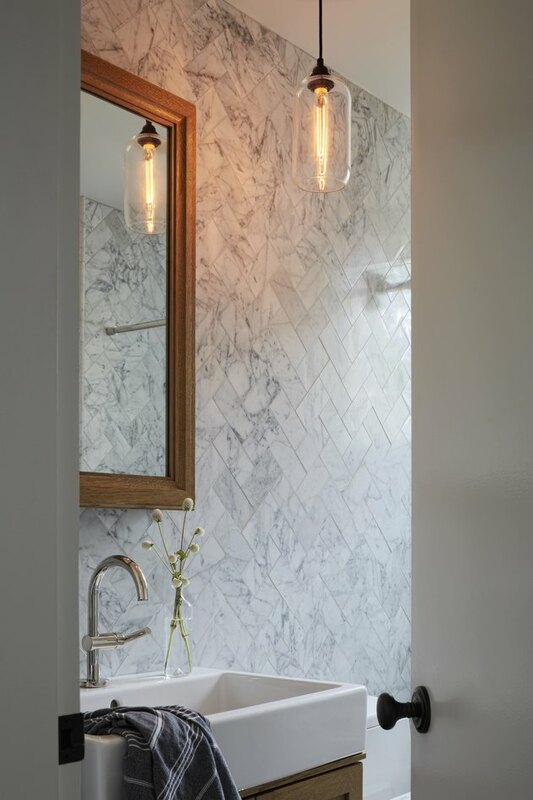 In the bathroom, a pendant light from Niche Modern illuminates the space that is decked out in Carrara tiles. A sink and tub from Duravit are outfitted in fixtures by Hansgrohe and a faucet by Restoration Hardware. By retaining parts of the original stone wall structure, the house becomes an intriguing amalgam of old and modern styles.